This divan base by Airsprung features a high quality and contemporary base which is crafted from sustainable and sturdy timber wood. The divan base is upholstered in durable fabric using a luxury Belgian Damask and should you require them it will feature good quality easy opening drawers which utilise smooth glide runners and are finished with metal handles. This Airsprung divan choice offers a variety of different spacious storage options which don’t compromise the comfort or support of the divan itself and is a great way of fitting extra storage into your room. Available in various colours this divan base can complement a variety of decors ensuring that the finish feels tailored towards your personal tastes. This divan base also features castors for convenience. Please quote this Products's code 02130D to speed up your query if related. by Airsprung features a high quality and contemporary base which is crafted from sustainable and sturdy timber wood. The divan base is upholstered in durable fabric using a luxury Belgian Damask and should you require them it will feature good quality easy opening drawers which utilise smooth glide runners and are finished with metal handles. This Airsprung divan choice offers a variety of different spacious storage options which don’t compromise the comfort or support of the divan itself and is a great way of fitting extra storage into your room. Available in various colours this divan base can complement a variety of decors ensuring that the finish feels tailored towards your personal tastes. 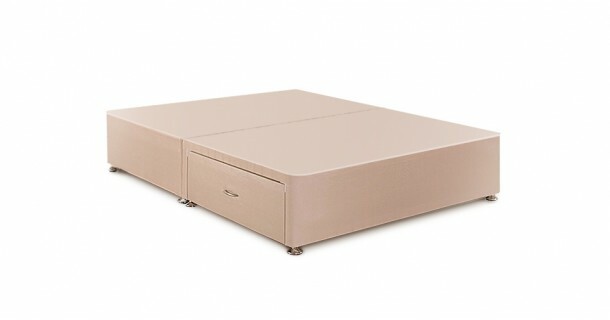 This divan base also features castors for convenience.